in Figure 1, housing-related reasons were the most popular response with 17.2 million (48.0 percent). 1 Family-related reasons were the second most selected choice with 30.3 percent, followed by job-related (19.4 percent) and other (2.3 percent). These data come from the 2013 Annual Social and Economic Supplement (ASEC) of the Current Population Survey (CPS). 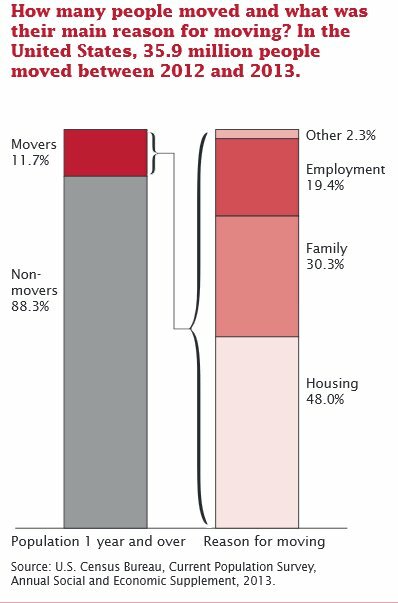 The 2013 ASEC questionnaire had a list of 18 common reasons for moving, with an additional option to write-in reasons that did not fit into any of the predetermined choices.